The soulful artist from the hardscrabble streets of Detroit gets a teaching job in a sultry slice of Brazilian paradise. As he sits through yet another staff meeting, he is distracted by one of the Brazilian teachers, a feisty femme fatale named Gi. The next thing they know, sparks have flown; artistic soul connection has occurred; vows have been exchanged; and they’re moving to Thailand. Artistic soul connection captured on camera. I caught up with them a year and a half into their Thai journey. They took me and the mister to Rasayana, a raw food restaurant, where I peppered them with questions between bites of pure health. Ruth: How on earth did you find yourselves in Bangkok? What was the moving process like? Gi: It was a complete whirlwind. We got engaged in Brazil at Christmas time after 4 months of dating. Soon after, Kirk got a job in Thailand. We couldn’t bear the thought of being separated, so I managed to complete 38 course credits (to complete my international teaching license), plus 2 student teaching practicums and a thesis so that I could also teach at the school. Oh yes, and I planned the wedding by myself because my family lived in a different city. Ruth: Wow. After all the craziness of actually moving here, has anything about Bangkok surprised you? Kirk: Oh yeah. The soi (street) dogs. The streets here are literally crawling with diseased animals. Gi: I was shocked by the sheer amount of sugar that gets added to everything. Everything from pizza to cups of noodles is incredibly sweet. I mean, I’ve travelled to the US, and thought that the food there was sweet, but Thailand takes it to a whole new level. Ruth: So strange that you don’t like going into catatonic shock when you eat dinner. What about the good parts of life in Bangkok? Gi: The massages are great. In Brazil, massages are really expensive, so I didn’t often get one, but here, they are cheap and amazing. I’ve also really been touched by how kind people are here – they are always smiling, and hospitable, and ready to help. It helps me to feel at home, because Brazil is also a very warm culture. Here is a story to illustrate how kind Thai people are: we once forgot our iPods on a park bench in Hua Hin (a town several hours from Bangkok). Someone found them, and managed to locate the hotel that we had stayed at. We had already returned to Bangkok, but the hotel manager contacted us, and found a way to courier the iPods to us. The courier refused any payment. And there are more stories like this. 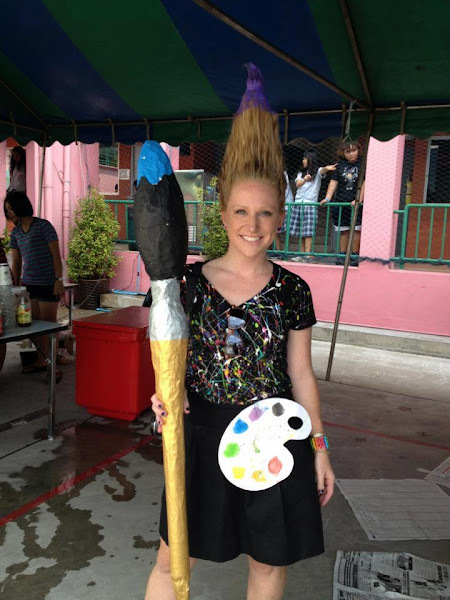 Ruth: Other than soi dogs and sugar, what has been the hardest part of adjusting to life in Thailand? Kirk: It took a while for us to adjust to life in Thailand, and in the beginning, there were some really dark days. At one point, Gi turned to me and said “I feel utterly misplaced.” We asked ourselves why we had moved in the first place. The cultural honeymoon was over. Later, we adjusted, but it was a difficult transition. Gi: There are so many things that I miss about home. I miss my friends a lot, and I miss my cultural references. I love film, art, and live music – and it can be hard to find these things here. It has also been challenging for me to learn how Americans behave socially – they are very different from Brazilians. Because most of the people I work with are Americans, it is as if I am adjusting to two different cultures at once. Learning how Americans behave socially. Ruth: Do you have any advice to offer other expats, or people who are considering expat-ing to Bangkok? Gi: Be patient. There’s no running away from culture shock. I thought that it wouldn’t be so difficult, because I was moving here from another developing country, but there are huge differences between Brazil and Thailand. Be patient, and come with an open mind. There is so much that you need to learn! At some point, you’ll find safe ground, and you’ll be able to acknowledge your culture shock, and learn to like life here. I don’t know of anyone who hates Thailand once they’ve given themselves time to adjust. Kirk: Bring a hobby with you, something that you can do when no one is around. There are going to be times when you don’t want to leave your apartment. Even if you’re married, you’ll feel lonely at times, and you won’t know what to do – you need something to occupy yourself. For me, it’s been the guitar. Kirk: And one other thing: remember that the more a country is developing, the more you’ll see its inner workings. You’ll see things that you would never see in the developing world. Life is just out there – it’s exposed. This is definitely the case in Thailand. Ruth: Anything else you’d like to add before I let you eat your incredibly wholesome lunch/debrief who did the most wedding planning? Gi: Yes – if you like vintage clothing, check out Union Mall! I love to wander through it, and I never know when I’ll find that one (or ten!) perfect piece of clothing. It’s how I cultivate my colourful style. Ruth: Are you saying that I’ll actually get some style if I shop at Union Mall? Gi: In Thailand, anything is possible.